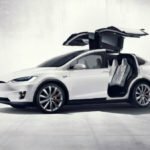 The 2018 Tesla Model X, the full-sized, all-electric, luxury from Tesla is an all-wheel-drive SUV of the upper class with electric drive, which was presented as a prototype on February 9, 2012, in Los Angeles and has been delivered to customers since 29 September 2015. 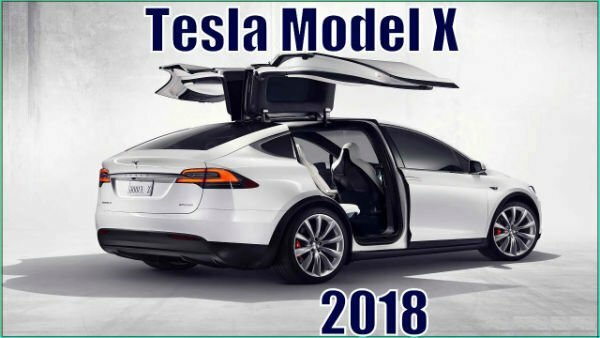 2018 Tesla Model X is built on the platform of the Tesla S model sedan and falls into the class of luxury sports-utility vehicles. Tesla Model X for sales was launched in September 2015. More than 10,000 units were sold per year. The vehicle is exclusively powered by 4×4, which provides 2 separate electric motors on each axle. Produced in 5, 6 and 7-seat versions. At first glance, Model X will take a look at its rear wing doors, which the carmaker calls Falcon WIngs. They are electrically tilted upwards, allowing for the comfortable entry and exit in the third row of seats at the 6 and 7-seat versions. The Model X can accommodate up to 7 people. The second and third row of seats can be reached by wing doors. These so-called falcon wings are two-membered. They have a second joint, which is parallel to the main joint, above the window, which means that less space is required for opening. In the open state, the upper door parts opening the roof are vertical and the lower parts opening the car sides are horizontal. This allows upright standing next to the car under the open wing doors, with their lower parts not projecting upwards. Like the 2018 Model S, the Model X has two storage compartments: the trunk in the rear as well as a front trunk. The rear trunk has a storage space of 745 liters in the concept car. The folding over of the seats increases the trunk volume to over 1645 liters. The storage space under the bonnet offers a loading volume of 150 liters. 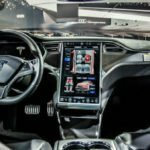 As already known from the TeslaModel S, the Model X 2018 also has a 17-inches touchscreen. 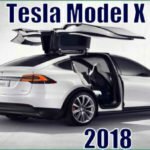 The 2018 Model X is the first Tesla model, which is available in a vegan version. A trailer coupling for up to 2250 kg trailer load is available as special equipment. As a result, rear supports can also be mounted on bicycles or skis, especially since the roof doors cannot be fitted with roof supports. According to National Highway Traffic Safety Administration, it is the safest SUV ever tested by the authority. 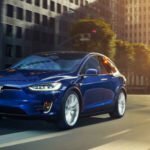 Tesla offers the 2018 Model X in three variants with several battery capacities. In all variants, two electric motors drive one of the two axles. The P100D version, which was launched in August 2016, achieves an acceleration of 0 to 100 km / h in 3.1 seconds with the optional “Ludicrous” mode, and is, therefore, one of the world’s most powerful series vehicles, in addition to the Tesla Model S.
Previous Tesla electric cars excelled with excellent acceleration. This is not the case for nearly 2.5-ton Model X. The most powerful version of the Tesla Model X P100D accelerates from 0 to 100 km / h in 3.1 seconds and can be reprinted for example by most Ferrari super sports cars. 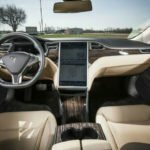 In addition, the Model X is a very manageable vehicle, mainly due to the low focus on the “conscientious” battery that is integrated into the floor. In addition, Until then, the system can be used as a driving assistance system (autopilot). For the end of 2017, an autonomous demonstration trip from San Francisco to New York is planned for 2018 Tesla Model X.